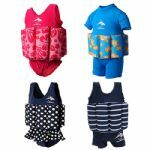 Our one-stop online baby swimming shop is jam-packed with the latest baby swimwear and baby swimming equipment to hit the market from all the top brands including Splash About, Konfidence, Zoggs and more. 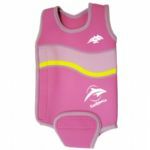 Shop our range of baby wetsuits, swim nappies, changing mats, baby swimsuits and even baby swim socks. 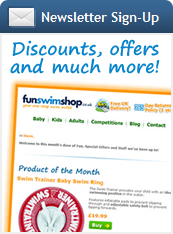 We have the latest baby swimming accessories to hit the market including the Bema baby swim seat, Swim Trainer learn to swim ring and more. 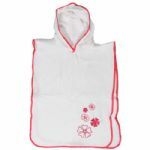 We've got all the baby swimming equipment you'll need from baby swim socks to cute and cuddly poncho swimming towels to keep your little one warm after baby swimming. 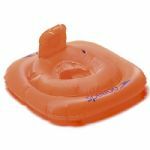 We've got an excellent selection of baby swim seats which help to give bot baby and partent freedom in the water. 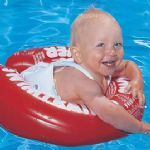 Baby swiming aids are great for introducing your baby to the water and will help on their journey to learning to swim.